Henry Ford is practically revered as the patron saint of American cars, and the Model T is his holy text. But it wouldn’t have happened if not for the life, and possibly the death, of two of his biggest rivals: the Dodge brothers. And if it weren’t for a small complication, such as the most deadly pandemic in recorded history, our cars might look very different today. On Nov. 1, 1916, Henry Ford’s son Edsel married Eleanor Clay in the home owned by the department store tycoon J.L. Hudson. It was a small, cozy informal affair filled with close friends who happened to be members of Detroit’s elite. This guest list included a pair of fiery, hard-drinking redheaded brothers named John and Horace Dodge. The Dodge Brothers weren’t always so welcome in polite society. Both Horace and John were incredibly prolific drunks and public rabble-rousers. Horace once started a brawl in a bar and then threatened to kill the owner of the newspaper that reported it. John knocked a man out cold on the street when the passerby mocked him for being unable to crank-start his Ford. And when a Grosse Pointe country club denied John membership, he built a huge mansion directly across the street with a 12-car garage. They were loud and uncouth, even for a loud, uncouth town like turn-of-the-century Detroit. The brothers came up from working class roots, the sons of a machinist and seamstress, but by the time the brothers attended Edsel Ford’s wedding they were incredibly wealthy men with the second most successful car company in America in their own name—and a 10 percent stake in the Ford Motor Company. On that chilly joyous day in Detroit, John and Horace celebrated the wedding of the heir-apparent with Henry Ford and his family. The very next day, they sued him. The brothers started a machinist shop in Detroit in 1900. Their first major job was building transmissions for Ransom Olds, founder of Oldsmobile. Then in 1903 John and Horace took a chance on a well-known engineer, entrepreneur and failure at both named Henry Ford. Duds like the Ford’s Quadricycle and the Detroit Automobile Company had marked Ford as a washout and a loser. The Dodges weren’t just auto parts suppliers and stakeholders in Ford’s businesses; in 1903 they were the only ones willing to do business with Ford at all. It was a risky deal, but a canny one befitting of these two sets of hardheads. Nobody else would make it, but nobody else succeeded like they did, either. Every single component of the original, early 1900s Model A was made by the Dodges, while Ford assembled the cars at his plant on Mack Ave. (This was before Ford set up his famous moving assembly line, which wouldn’t enter production until 1913, and before the Dodges made their own cars.) The Dodges gave up all of their other contracts to focus solely on the Ford business. Now their fates were tied together. The brothers made sure Ford paid dearly for their time and energy. They were granted a 10 percent stake in Ford Motor Company, and would be the proud owners of the entirety of its assets should the company fail. Luckily, the gamble paid off almost immediately. Ford had made $3 million by the time the second year of the partnership rounded out in 1905, with the Dodge Brothers already making back their investment. And this was still years before the Model T even made its debut. The Dodges had become incredibly wealthy men with a significant stake in one of the most successful companies in the world. And Ford’s success would be shared with them—at least, the brothers thought so. John and Horace were already well on their way to challenging Ford’s supremacy in the auto market when Ford stopped paying dividends to his investors. It was a move, some speculate, made mostly to send the Dodge Brothers’ rising star crashing to the ground. The brothers brought a lawsuit against Ford seeking $39 million to be distributed to stockholders. Ford was blindsided by the move, though he probably shouldn’t have been. Ford claimed that he had stopped paying dividends to investors because he wanted the money to reinvest in workers, new models and to build his gigantic River Rouge plant. He wanted to do all that and at the same time keep the price of the Model T incredibly low. In 1908, a Model T cost $950. By the time the lawsuit came around in the fall of 1916, Ford had even been dropping the price down to $360—only about $8,350 in today’s dollars. While lowering the price of his product, Ford was also screwing his shareholders. He was also screwing the Dodge brothers in particular, as their sales were hurt by Ford’s rush to the bottom. See, they had begun building their own cars under the Dodge Brothers Motor Company name three years previously, and saw Ford’s move as throttling their income and undercutting the automotive market. To give you an idea of how intense this time period was, in 1913, the Dodge Brothers sold around 250 cars during its first year in existence. It sold 45,000 the next year, as Chrysler.com recounts. The year the brothers brought the lawsuit, Dodge was the second-largest automaker in the U.S. behind only Ford. And they were respected machines. The Dodge brand had a reputation for durability, which led to Dodge becoming the official truck of the U.S. during World War I. As much as the cars that bear their names, this lawsuit would leave an enduring legacy on America, for better or worse. It was also something that Ford would never allow to happen again. Ford resigned as president of the Ford Motor Company in December 1918, allowing the newly-married Edsel Ford to take up the family mantle. Using shrewd tactics, old man Ford systematically forced out everyone who could oppose him. He announced he would start a new business apart from Ford and make an even better car than the Model T.
Ford shareholders, realizing their shares would be worthless should this occur, sold all of their standings in the company back to Ford and his family. 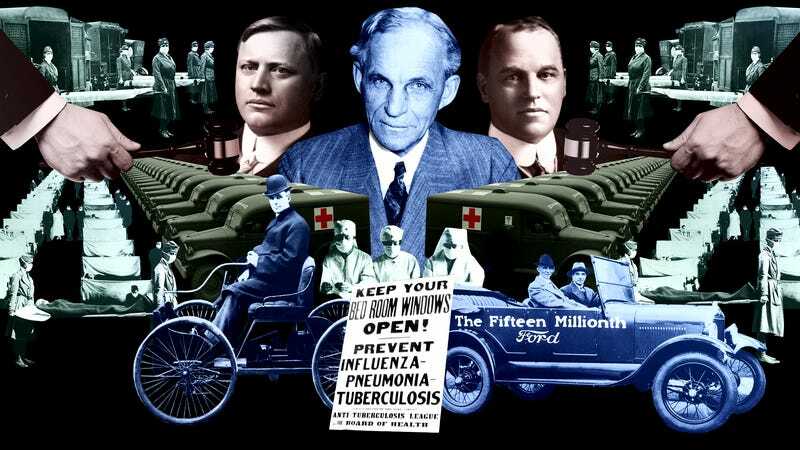 By July 1919, the Ford Motor Company was completely in Ford family control. The Dodge brothers’ shares were also bought out by Ford, but they were far too busy to worry about Ford’s consolidation of power. Anyone who has been to an auto show knows their crowded halls are vectors for illnesses, and that was true then as now. While attending the 1919 New York Automobile Show, the brothers were both struck seriously ill. They were infected during the last very gasp of a Spanish flu outbreak. Often called the forgotten epidemic, we now know the Spanish Flu by its proper scientific name, H1N1. The flu first came to New York in the summer of 1918 from sick sailors of the Norwegian vessel Bergensfjord. Just as the carnage on the front lines of World War I was winding down, the dying on the home front was beginning to pick up speed. During one month in 1918 during the first wave of the disease, New York experienced 147,000 cases influenza and pneumonia. That resulted in 20,608 deaths. And that figure is much lower than other cities on the eastern seaboard. Worldwide, the flu would infect 500 million people (or one-third of the human population at that time) and kill 50-100 million of them, making it the worst pandemic in history. John and Horace Dodge fell ill at what was the tail end of the third wave of the outbreak in 1919. John, a man who started life running barefoot through the tiny town of Niles, Michigan, died in his grand suite at the Ritz-Carlton Hotel of influenza on Jan. 14, 1920 at the age of 54. Horace never recovered from the blow of his brother’s death. He remained ill for another year, even moving to Florida in the hope that the climate would revive him, but his body was too damaged from years of heavy drinking. He succumbed to cirrhosis of the liver less than a year later on Dec. 10 1920. Rumors swirled at the time of the men’s deaths that they had actually died after they drank tainted woodgrain alcohol at a Prohibition-era party, or that perhaps Henry Ford had one of his agents poison the men. These rumors, as described in The Dodge Brothers: The Men, the Motor Cars, and the Legacy, were unfounded. Ford was reportedly shaken when told of John’s demise in New York, and he attended his former rival’s funeral in Detroit. Additionally, Henry and Edsel Ford served as pallbearers at Horace’s funeral. Unlike Ford, the Dodge brothers did not have a clear heir to the throne, and no one in their families was interested in picking up the family business. Plans for the iron and steel works were scrapped, and while Horace had tried to shore up the company in the year he had left, it was too much for a sick man to manage. Years before, financial interests had tried to buy the company, but the brothers refused. Their widows were much more willing to play ball. In 1925, Dodge was sold to the investment group Dillon, Read & Co. It then passed into the hands of Chrysler in 1928, and helped make Chrysler the third-largest automaker in the world overnight. In the end, it wasn’t personal failings or follies that subverted Dodge—it was dumb, terrible, black luck. The Spanish Flu showed no mercy, reaching down to the poorest Russian peasant and up to the heights of industrial American power. And while the brothers themselves and their fate may be forgotten, their actions in life are still very much with us today. The lawsuit brought by the brothers against Ford became the legal basis for the idea that companies exist primarily to generate profits for shareholders, setting the stage for the aggressive rise of the American corporation. As I said, these men didn’t just build cars. For better or for worse, they built modern America as well.